The EPA has found that trees and vegetation planted around homes are especially effective in reducing the energy consumption, air pollution, and noise pollution associated with increased air conditioning usage in residential settings. On a block of eight average single-family homes, front lawns provide cooling equivalent to about 70 tons of air conditioning. This evaporative cooling helps to mitigate the urban heat island effect and and reduce heat-related illnesses. Our goal is to have front yard landscaping that is beautiful year round, water-wise, and easy to maintain. Luckily there are many beautiful, drought-tolerant plants that are native to California and other mediterranean regions. 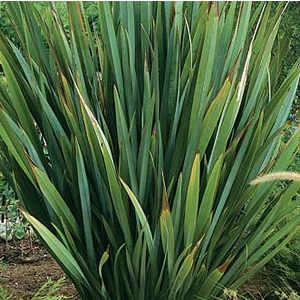 Evergreen Plants Designs should include plants that look good year round. Adequate Plant Coverage At maturity, at least 75% of the bed should be covered with healthy plants. Adequate Irrigation The irrigation must be compatible with the communities existing irrigation system. Determine whether your site is: mostly sunny, mostly shady, or under a redwood. Decide if you'd like to add ornamental trees to your planting bed. Ornamental trees such as Japanese Maples, Magnolias, and Dogwoods add nice structure and interest to designs, and can provide some light screening between front windows and the street, and neighboring front entryways. You can find the approved tree list here. Pick 3-5 plants from the list below or work with your landscape designer or nursery specialist to create a plant list with evergreens or a mix of evergreens, deciduous plants, and annuals. Use size estimates to make sure that there is adequate plant coverage. Submit a Landscape Change Request. The approval process ensures that your landscaping is compatible with our irrigation system and maintenance program, and protects you (and future homeowners) from being asked to fix problems after the installation. We are in USDA Hardiness Zone 9. Sunset Climate Zone 16. Homeowners may find it helpful to walk around the neighborhood and take pictures of some plants and landscape designs that they like, or talk to neighbors about which landscape designer they like to use. 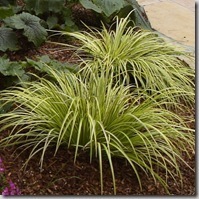 Nursery specialist can usually help people identify plants from photos. If you'd like some help with your landscaping, let the community manager know. A landscape committee volunteer may be able to give you some suggestions. Wegman's Nursery and M&M Nursery both do special orders. Orchard Supply and Lyngso sell compost, mulch, bender board. Thousands of water wise plants grow well in sunny areas here in Northern California. Homeowners can work with their landscape designers or nursery specialist to create landscape designs with color palettes that reflect their preferences. For homeowners who are looking for a classic design, a green an white palette with a combination of evergreen shrubs and grasses, or a simple boxwood planting is always an elegant choice. These hardy evergreen plants are easy to grow and look good year round. 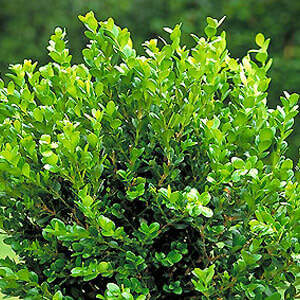 Winter Gem Boxwood - An excellent evergreen shrub for small hedges. The rich green foliage stays shiny and green year round. 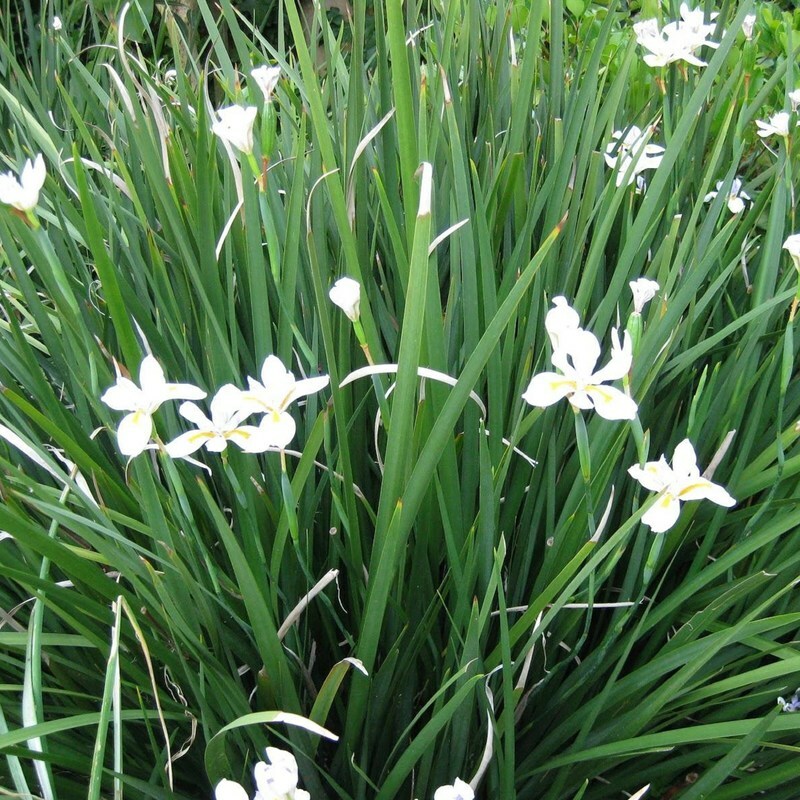 African Iris - Evergreen with white flowers with gold accents. 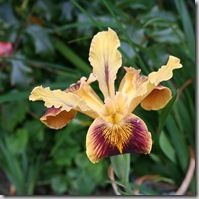 Irises are waterwise and look good year round. Agapanthus - Good for borders. Produces luxurious green foliage year round and either white or blue flowers in summer. Homeowners with shady planting beds can enjoy ornamental dogwood trees, azaleas, camellias, dogwoods, hydrangeas, rhododendrons and a number of native and non-native drought tolerant ferns. Homeowners can work with their landscape designers or nursery specialist to create color palettes and designs that reflect their preferences. Redwood Tree Care: Coast Redwood Trees grow only one place on Earth – here on the Pacific coast from Big Sur to southern Oregon - making them a unique characteristic of our neighborhood. Our arborist say that we have some of the healthiest redwood trees in the area. Redwood trees need redwood duff to acidify the soil and keep their roots cool and moist in the summer. ​Keep redwood trees healthy by letting the redwood duff accumulate to form a thick layer of natural mulch. Grass does not grow well under redwoods, and mowers can damage a redwood's shallow roots. If you are renovating a planting bed under a redwood, consider expanding the planting bed to at least the tree's drip line to protect the tree and create a clean border between turf and mulched areas. ​Homeowners can make their redwood trees a focal point by creating an open space with a layer of fir bark mulch and natural redwood duff under their redwood trees. Pushing the border between the mulched areas and the turf out to the drip line creates a clean, deliberate aesthetic. Only certain plants will grow in a redwood's dry, acidic, shade. People who prefer a fuller look, can select shrubs and ferns that complement redwood trees and naturally grow well in these conditions. If you'd like to create a planting bed under a redwood tree, consider adding additional compost to help the new plants establish. 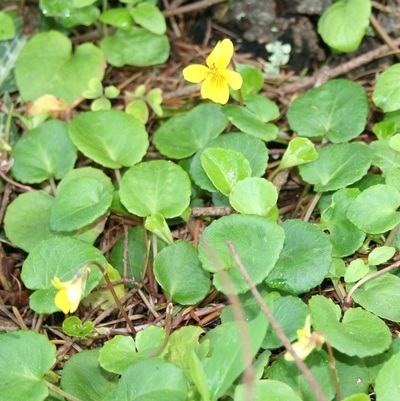 ​These evergreen plants thrive under redwoods. Hover over pictures to see plant names and information. Plants that can survive under redwoods are good choices for other shady areas as well. 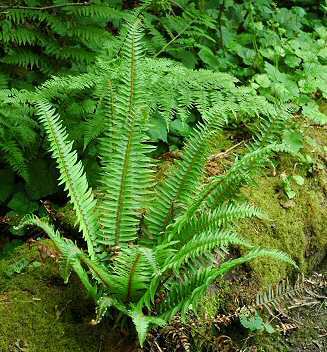 Giant Chain Fern has thick, leathery fronds that shoot up straight and then spread out at the top, the plant resembles a cool green fountain. Grows 4 to 6 feet tall. 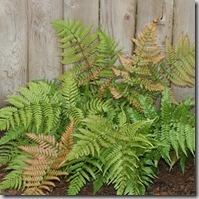 Autumn Fern changes color dramatically with the season: In spring, the fronds are a blend of copper, pink, and yellow; in summer, they turn green, then a rusty brown in fall. Grows 1.5-2ft tall and wide. Western sword fern. Grows 1 foot tall. 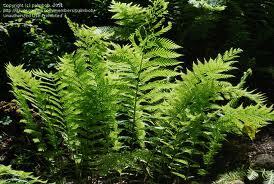 A mature plant can produce up to 100 dark green fronds, which creates a woodsy feeling all year. Grows 1-2 ft tall. Rhododendron Royal Purple. Vigorous shiny dark green foliage. Purple flowers have a small yellow-orange flare that gives richness to the color. Grows easily, is very hardy and gets better with age. Grows 5-6 ft.
Rhododendron Noyo Brave Flowers unfold dark pink, then turn light pink, then white, almost appearing like 3 colors on one plant! One of the best rhododendrons for foliage and form. Grows to be 3-4 ft. tall. 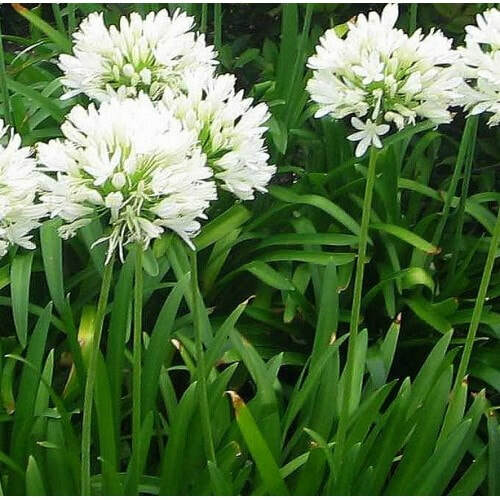 Agapanthus Storm Cloud- produces luxurious green foliage that tinges purple-red in the winter months. 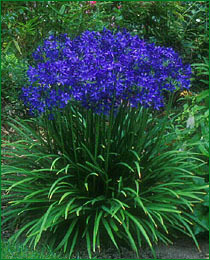 In summer large deep blue flowers rise far above the foliage on 3-4 foot tall stems. Also comes in light blue and white. Douglas iris - These come in Blues Purples and Whites too. Redwood violet (Viola sempervirens) - ground cover. Compost (optional but recommended) - You can amend the soil by spreading 2-3 inches of compost on the bed. Amendment Mix is a mixture of Fine Redwood Amendment and Garden Compost. This product is good for improving our clay soils and can be found at Lyngso. Please Note: Only Fir Bark Mulch is allowed. Wood chips (natural or stained) are not allowed. Edging Materials: Homeowners can use Lin Creek Cobbles as edging, bender board as edging, or no edging. Lin Creek Cobbles are recommended as a permanent material that will not lift or fade. Use 3"- 8" Cobbles. If bender board is used, it must be installed flush to the ground and invisible or barely visible from the sidewalk. Other plastic materials including landscape cloth are not allowed in front yards and any areas that are visible from the street.